The Olney and District Historical Society published in 2008 a reproduction of Oliver Ratcliff’s 1907 book ‘Olney, Bucks’ (colloquially known as his ‘1907 Olney Almanack’). It was published to commemorate its centenary in 2007 and provides readers with an insight into many aspects of life in Olney one hundred years ago. In particular, the social conditions prevailing in Olney during the late Victorian and Edwardian periods can be readily appreciated from the wide range of topics covered by Ratcliff. 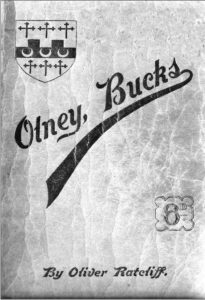 Although the authenticity of the detail in Ratcliff’s 1907 publication cannot be guaranteed, it is considered to provide a realistic view of life in Olney at that time. The section entitled ‘My Look Round Olney’, see Part 2, illustrates the extensive range of products and services that could be acquired from the town’s traders. This range is even more impressive when considering the town’s population was only around 2,700 at that time and the majority of its inhabitants were employed in the poorly paid shoe, lace and agricultural industries. Ratcliff’s descriptions of Olney’s churches, clubs and associations, together with the local devil-lore, jokes, and cartoons, reveal the local activities, pastimes and humour of the period. Relatively little is known about Oliver Ratcliff himself. The 1891 Census lists him as born in Ashby-de-la-Zouche, a printer and stationer aged 31 years, apparently a bachelor living with his parents ‘over the shop’ at 13 High Street South. As stated in his foreword, he produced an earlier Olney Almanack in 1887. This May 2016 webpage version, using Calameo software, has been uploaded because the 2008 reproduction was sold out some years ago and there are no plans to reprint it. For the reader’s convenience, this webpage version presents the book in three separate Parts as the 2008 reproduction comprises some 242 pages. The Preface and Contents pages appear in all three Parts.